Ok, so I decided to blog about this issue that has been a constant battle for me. When I started this blog and I know I've probably mentioned this before and you’re probably tired of reading about it but, it was meant to be a lifestyle blog. A place where I can share my experiences and life as it happens. It did start out that way but somewhere along the way, it morphed into more of a fashion blog than anything else; which Is not necessarily a bad thing. I love sharing and I love listening to people that are willing to share their experiences. I know sharing in this form has the tendency to leave you a little vulnerable in some areas because you're leaving a bit of yourself out there but the reward that comes from it is satisfactory. 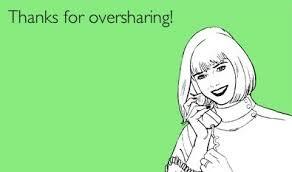 Over-sharing became a concern early on so I went to the other extreme where I completely stopped sharing. It's always a constant battle in my head; I have so many posts in draft that I ended up not posting because I felt It might be over-sharing. But at the end of the day, I wish I had published those posts for one reason or the other. So, what I'm trying to say is I’m currently in a state where I’m trying to find the balance between over-sharing and not holding myself back on posting my experiences and information that someone else might find useful. Reason I know this is because I go looking for this exact information and personal experiences online to relate to while going through it. So, If one person finds and reads about my experience or what I have to say and it resonates with them, then that's all that matters. I love writing and I love to document everything in one form or the other; and this blog allows me to do just that, which is one of the reasons I started blogging all together. In a way, I think it holds me accountable to document life's moments. Perfect example is my pregnancy with Eliana and being a mom. I'm glad I have all those "Pregnancy Journals" and "Letters to Eliana" series. Even though it may not contain all the information I wanted to remember (again, didn't want to over-share), I cherish what I have documented. Otherwise, I wouldn't have any of it. I would have had the intention to but it would have never been done. That's where the blog comes in and that's one of the reasons I keep blogging. I suppose you can see this blog both ways, first as a way to document memorable life's moments, events, and experiences and at the same time, share with others who can relate or find useful information in it. I know what you mean. However, I enjoy reading lifestyle posts the most. I miss bloggers like From Marriage to Motherhood for that same reason. I went through reader withdrawals when she stopped blogging. Hey girl! I enjoy reading lifestyle posts the most as well, that's one of the reasons I'm trying to stay true to my intent. Omg! I feel the same way about her From Marriage to Motherhood. I pulled a couple of all nighters to catch up on her blog when I first found her. Definitely miss her blog.